2.How do tenants find a property? 5.How are tenants supported in disputes? Privately rented housing is a critical part of the housing market. It provides homes for people who either cannot afford to buy, or do not wish to, and provides for families who fail to meet eligibility criteria for social housing. It also allows people to move more easily for work, and thus facilitates economic growth and development. These general tenets hold across both England and Germany, yet the demographic profile of those who live in rented housing, and their reasons for doing so, differ in a number of important ways betweem English and German private tenants. First, as shown in figure 1.1, Germany’s rental market is much bigger than England’s, and its position appears to be more stable – the proportion of the population renting in Germany has shifted little over the last decade, and was at least double that of England in the 10 years from 2004 to 2014. England’s rental market is growing quickly. In 2004, 2.3 million households rented privately, but a decade later that had risen to 4.3 million – an increase of 86 per cent (DCLG 2016). Given the growing significance of renting in England, it is therefore worth looking to Germany, one of the largest rental markets among the OECD countries (Deschermeier et al 2016), to understand how the state manages such a large private housing market successfully. In Germany, where a larger proportion of the population lives in rental accommodation, the demographics of tenants are more varied across the age and income spectrum – and here, we need to consider all tenants, whether in social or privately rented accommodation, as the lines between the two are significantly blurred in Germany in a way that they are not in England. The average age of a ‘head of household’ in the German rented sector is 51.9 years (Westerheide 2011). While this is a younger profile than German owner occupiers – estimates suggest 58.4 years (ibid) – it is still typically older than England’s young rental demographic. Renting is also a common experience for individuals from a range of social backgrounds. White collar workers are as likely to be private tenants as they are owner occupiers, 29 per cent versus 27 per cent, while Westerheide (2011: 51) concludes ‘that a broad social spectrum – including all income classes and occupational types – lives in rented apartments and houses as well as in owner occupied housing’. There are nevertheless some similarities with the English experience: the German rental market also has a higher proportions of single person households, lone parents, and couples without children (Fitzsimons 2014). Who owns the rented homes, and what impact does this have? While the demographics of tenants in both countries are relatively varied, the ownership structures of their lettings sectors are not. Despite a larger rental market in Germany than in England, the ownership structures of properties are not hugely different. In England, just under 75 per cent of all landlords are private individuals or couples rather than companies, and over half of all landlords own fewer than five properties with only three per cent of landlords owning over 250 (Ball 2010: 22). Perhaps surprisingly, given its reputation for attracting institutional investors, Germany’s market is structured similarly. Sixty-four per cent of rented properties were owned by small-scale, ‘amateur’ landlords, and 36 per cent by professional landlords (GDW 2015). The latter figure includes stock which, in England, would count as social housing (for instance, housing association properties) so in practice the figure for the ‘amateur’ part of the private rented sector is much higher. This finding is reinforced by a recent study, which found that, of flats rented out by small-scale landlords, 57 per cent of landlords owned only one flat, while 2 per cent owned more than 15 units (BBSR 2015). Government policies have also incentivised individual investment, such as making the costs of being a landlord tax deductible. In Germany, costs associated with refurbishment can be used to offset any taxable income to encourage landlords to maintain properties in good condition – while landlords can offset losses on rental property against other sources of income (Kemp and Kofner 2010). Critically, rented homes are also subject to a generous depreciation allowance of 2.0–2.5 per cent per annum, a tax allowance that allows investors to deduct over time the depreciating value of the asset which, in their review for DCLG, Oxley et al (2010) argued was a major component in stimulating individual investment in Germany’s private renting sector. Additionally, capital gains tax does not apply when a property (including an investment property) has been held for over 10 years, giving German landlords an incentive to hold on to a property beyond this threshold. This has made investment in rented accommodation particularly attractive in Germany (De Boer and Bitetti 2014: 38). The tax treatment of English landlords is less generous than in Germany’s case, in the absence of a depreciation allowance.3 However, the incentives to purchase second homes remain fairly strong – there are relatively weak capital gains and inheritance tax systems, and council tax rules that incentivise the acquisition of properties for investment. To encourage these homes to be let, English landlords continue to enjoy a limited form of mortgage interest tax relief (within new income limits), and can use a ‘wear and tear’ allowance to deduct basic repairs from their tax liabilities (HMRC 2015). The shape of the landlord market is said to matter because it may affect the extent of professionalism in the management of properties. For example, small-time landlords may lack the necessary knowledge or skills to responsibly manage their properties. Kemp and Kofner (2010) comment that newer landlords in England may lack a comprehensive understanding of their responsibilities; Shelter (2011) found that many of the complaints made against landlords resulted from landlords not being aware of their responsibilities rather than deliberate neglect. Larger property portfolios might also achieve economies of scale in management. Third and finally, the ownership structure of the rental market is an important driver of the supply of new housing (see Montague 2012) – in particular, a market dominated by larger‚ institutional landlords, will be more orientated towards building new homes than a market dominated by smaller landlords looking to own only one or two properties. However, as we highlight another paper (Davies et al 2016), the provision of rented housing in Germany has grown much more quickly than in England in spite of similarities in ownership structures, and thus the role of institutional investors in Germany appears to have been overplayed. 1 This poses a particular challenge for future housing benefit payments. 2 Although, when asked which was safer, responses revealed the inverse – the perception that employer pensions were much safer than investing in housing. 3 Given the real-terms increases in house prices of old and new dwellings across England in recent decades, housing has rarely been a depreciating asset over the medium term. 4 Observations made under Chatham House rules at Anglo-German Seminar on the PRS, London, 2 March 2016. The process of finding a rental property in England and Germany is fairly similar. Research as part of the ‘TENLAW: Tenancy Law and Housing Policy in Multi-level Europe’ project (Cornelius and Rzeznik 2014) reveals that in both countries, a typical route is to use estate agents who can assist in both searching for properties and undertaking viewings. As in England, the letting agents are typically also involved in negotiating the contract on behalf of the landlord, and in managing the property. As businesses, letting agents charge for matching tenants with landlords. In Germany these fees were traditionally borne by the tenant, at a level capped at 2.38 months of rent (two months plus VAT). However, legislation introduced in 2015 means that agents’ fees may be charged only to the party engaging the agent’s services (usually the landlord, rather than the tenant). If landlords carry this cost, it may be passed on in higher rents, but only in the context of the rent limits set nationally and locally. Official data on the impact of this change are not yet available, but leaked data from the federal statistical office apparently showed that the average amount charged by an agent to a tenant when the tenant engaged the service has fallen to 50 per cent of its previous level since the policy was introduced (FAZ 2015). In the 2016 autumn statement, the government announced plans to ban letting fees in England. Under current practice, however, letting agent fees are usually equal to less than two months’ rent: typically, a tenant is charged around £350 (€445) (Shelter 2015)5 on top of what is charged to the landlord. While on the surface this may seem a more generous settlement than in Germany, it is worth remembering that, on account of shorter rental contracts, both parties can be subject to renewal fees on a more regular basis than their German counterparts. In both countries, alongside legislative changes in relation to letting fees, the internet is helping to cut out letting agents altogether. In Germany use of public forums and noticeboards (online and offline) is growing, with landlords and tenants making their own arrangements directly (see Cornelius 2014, Sparkes 2014). This practice has increased since the new legislation on letting agent fees, as, apparently, have unofficial transfers from one tenant to the next (Psotta 2016). Tenants and landlords are increasingly circumnavigating letting agents in England too, via direct landlord-to-tenant websites such as LandlordDirect and RentSquare. While the processes for finding a property may be similar, securing a tenancy is a little different. The process in Germany may often be more formal, with tenants writing applications to live in a specific property, and these applications will tend to require a range of documentation. For instance, checks will often be made as standard on the tenant’s financial status, including credit ratings and debtor lists. While equivalent checks in England are common, they remain far from standard practice. Perhaps the biggest hurdle of all in Germany, especially in areas with high housing demand, is finding a property to rent in the first place (Cornelius 2014). This can be considered an ‘insider/outsider’ problem, where those already in a secure property with regulated rents will hold onto it, while ‘outsiders’ struggle. For Scanlon and Whitehead (2014), ‘the outcome of [rent] controls that generate below-market rents (whether only for existing tenants or for new tenancies) inherently generates insider/outsider issues’, and indeed, in the case of rent restrictions on new tenancies when supply is inadequate, ‘queues, avoidance, evasion and the exclusion of vulnerable households becomes the norm’. In England on the other hand, higher turnover of rents and fewer expectations on the part of the tenant, including looser financial checks and a typically smaller deposit (as a percentage of the annual rent), means that accessing rented housing is usually relatively quick and easy for those able to pay the rent demanded by the local market. There are substantial deposit requirements in both countries to cover damage to the property. In Germany this Kaution can amount to as much as three months’ rent, compared to England’s traditionally lower requirements of one to two months’ rent (Shelter 2015). The presumption in both cases is that deposits will be paid immediately upfront. However, in Germany is possible to pay in three monthly instalments (Cornelius 2014). Nevertheless, for households on low incomes, in Germany in particular, this represents a huge hurdle for first-time tenants, or those who have lost their deposits. A significant difference when considering tenant deposits is the expectations on tenants with regard to property maintenance. German tenants typically enjoy a lot more freedom over the interior of the property – for instance, painting and redecorating without the need to inform the landlord. This is an understandable feature of an indefinite rental contract. The caveat is that if a tenant acquires a newly decorated apartment, the tenant is expected to redecorate when they leave. Such conditions are rare in England, where tenants are expected to inform landlords of any material changes to the property during their stay, and return the property to the original condition when they leave – albeit with no requirement to redecorate unless significant damage has occurred (Sparkes 2014). As Sparkes (2014: 23) goes on to explain for tenancies in England and Wales, ‘[s]hould the agreement remain silent […] [on redecoration and alterations] there will still be an implied common law condition not to commit “waste”: a concept which includes all changes, whether harmful or beneficial’. In both England and Germany, where properties have not been kept to the standard they were left in, tenants are liable for any damages done, with the cost of the damage deducted from their deposit. Building regulations in Germany require all dwellings to have at least one habitable room, one toilet, one bath or shower, and a kitchen/kitchenette. Any additional aspects depend on the tenancy itself which sets out the furnishings the landlord will supply (though flats are often let with no or a minimum of furnishings). In England and Wales, properties can be let furnished, partly furnished, or unfurnished. Landlords remain responsible for installations (and maintenance) of key service utilities (Sparkes 2014) but requirements for ‘habitable’ conditions can be fairly limited. In both countries tenant deposits must be protected: in Germany the deposit must be held in a bank savings account – in England deposits must go to a deposit protection scheme, which also acts to arbitrate between tenants and landlords over the repayment of deposits in the case of property damage. In terms of having a modern system in place to protect tenant deposits, England would appear to have the edge. However, a much wider arbitration role is played by German tenant associations, beyond merely disputes over deposit recovery. In both countries, tenants looking for a property will go through similar processes, looking for properties via letting agents or online, paying hefty deposits (especially in Germany), and going through various vetting processes, which again in Germany appear to be more stringent. A core difference is that finding a property in Germany can be much more difficult, and for various reasons the German rental market, with its long tenancies and low turnover, bears the hallmarks of an insider/outsider market, at least in the more pressured housing areas. 5 Based on currency conversion 5 May 2016. The starkest difference between the two countries’ rental markets is in the security of renting in England and Germany. In England, the system of tenancy law is loosely governed. Private tenants do not enjoy a right to a written tenancy agreement, though most tenants will have one (CAB 2016). Most rental contracts signed after 1997 will be assured shorthold tenancies (or ASTs), which typically provide security of tenure for at least six months, but generally a year. Tenancies are allowed to roll forward past the defined period in the contract, with either the tacit or explicit agreement of the landlord and tenant, but this ‘rolling contract’ period typically offers tenants less security than the period they originally signed up for. The consequence of more flexible rental contracts, and the different expectations of landlords and tenants of the UK rental market means that tenancies are typically fairly short. In England and Wales, an average tenancy lasts just 2.5 years (Allsop 2016) – and even shorter in high-pressure housing markets where the risks of void periods are lower. The situation in Germany is quite different. Most tenancies are signed on an indefinite basis. Research using the German Socio-Economic Panel Study6 has found that, as of 2010, the mean tenancy in Germany is 11 years, and the median tenancy length since 2006 has been approximately six years (Fitzenberger and Fuchs 2013). The law underpins indefinite tenancies, and offers very few exceptions apart from certain forms of ‘tied’ accommodation (Whitehead et al 2012: 136). There is some variation within the sector: for instance, the higher end of the market tends to have shorter tenancies relative to the lower end – eight years compared to 13 years (Fitzenberger and Fuchs 2013). It is not clear from the data whether this is a consequence of more mobile tenants at the top end of the market and vice versa, or whether those able to afford higher rents terminate contracts earlier because they have bought a property. Longer tenancies also reflect a culture of a longer-term investment outlook among German landlords. House price growth has, for decades, been very weak in Germany and, coupled with a tax system that stresses long-term investment (by grading away capital gains tax on properties over 10 years), there are therefore fewer incentives for landlords to sell (Kemp and Kofner 2010), and thus take possession of the property from the tenant. Allied to this, the higher resultant quality of rental properties and protected rents may drive tenants to want to stay put (ibid). Stability can benefit tenants and the wider communities. Moving home less frequently means children can enjoy greater consistency in their schooling, and there are increased opportunities to build community ties and integrate into neighbourhood activities. There is, though, a balance to be struck here – as Kemp and Kofner (2010) put it, ‘Residential mobility is relatively low in Germany, something that is both a cause and an effect of the long leases and strong security of tenure’. If especially strong advantages are given to existing tenants rather than their potential successors, that may lead to insider/outsider problems, lower levels of mobility (impacting, for instance, upon the labour market), and problems of unofficial, parallel markets. This means that, for whatever reason, at the end of a (short) tenancy a landlord can make it difficult for the tenant to stay by raising the rent, or can simply ask the tenant to leave at the end of their contract. If the tenant refuses to leave, a landlord can serve a section 21 notice (known as a ‘no-fault eviction’), which gives a tenant two months to move out, or go through the courts to forcibly remove the tenant by a court order. Indeed, it is reportedly becoming increasingly common in high-pressure housing markets for section 21 notices to be used to time for the end of the contractual period, to ensure that contract renegotiations or a termination of the tenancy can be initiated immediately and to prevent moving into the rolling on period (Osborne and Collinson 2015). German procedures provide much greater security. In the case of indefinite tenancies, those where the lease has been entered into for an unlimited period, tenants have the right to give ‘ordinary notice’ – a notice period of three months to end the tenancy. They are not required to provide justification. The landlord can also pursue this route but only if their circumstances change to meet fixed-term requirements, and supporting evidence must be provided (Cornelius 2014).7 The notice period in this instance can range from three to nine months, calculated according to how long the tenant(s) has been resident. Furthermore, tenants may issue an objection should they be able to provide evidence to suggest the ending of the tenancy would lead to hardship for them or their family and household (Fitzsimons 2014). The emphasis of these rules tends to strongly favour the security of the tenant, offering them a longer period over which to find alternative suitable accommodation – and to manage any associated changes to employment or other circumstances. The three months afforded to landlords in these cases is also typically longer than under an English AST; therefore they can also enjoy a longer period in which to find new tenants, reducing the likelihood of an empty property and loss of income. Landlords can also pursue either ‘immediate notices’ or ‘specific notices’ if they wish to end a tenancy agreement but both require a specific reason. In the former, this might include issues with late rent payment (two months or more) or criminal behaviour in the property, and can result in immediate termination while the latter refers to special cases prescribed by law including the death of a tenant where the family do not wish to continue the tenancy (ibid). Exempt from these rules, however, are tenancy scenarios where the landlord also lives in the property. The security of tenure offered to German tenants means that they move house less than tenants in some other countries. An international survey of private tenants in 2007 found that around only 10 per cent of German households had moved home in the previous two years, compared to 15 per cent of British households (Scanlon and Whitehead 2014). On the one hand, this is evidence of greater stability, on the other, it may reduce labour market flexibility, by making it more difficult for tenants relocating for work to find accommodation. The German tenant’s position, once in a property, is strong. As Fitzsimons summarises: ‘German law affords a very expansive concept of a lease contract, where the tenant’s position is very close to a property right. In other words, the lease contract gives claim possession when the object is in possession of the tenant’ (Fitzsimons 2014: 6). England’s tenants, on the other hand, enjoy very little security of tenure – contracts are short, and a landlord needs no justification at the end of that period for forcing an eviction. This gives tenants little protection against eviction if, for instance they complain about their property management, conditions, or even their rents. 6 A representative annual household panel survey including over 11,000 households in Germany, with analysis starting in 1985 and being continued on a yearly basis. 7 The alternative to indefinite tenancies is a fixed-term tenancy. These are rare, however, since they can only be secured if and when the landlord is able to prove that: (a) they wish to use the property in the future for themselves or their family; (b) they have plans to demolish the property, or carry out significant alterations; or (c) they have the intention of transferring the tenancy to an employee (Cornelius 2014). This must be established when the tenancy is agreed and so where it is not – and the landlord fails to provide sufficient proof – an indefinite tenancy will be standard practice. If the landlord’s circumstances or plans change during the tenancy, the tenant may also request a change in status from definite to indefinite, returning them to the standard practice. Similarly, if the landlord wishes to give ordinary notice, these are the conditions which must be satisfied with evidence provided. In both countries, the cost of renting privately is a problem. In the UK, research by Shelter in 2011 found that in more than half the country, renting a two-bedroom property cost more than 35 per cent of median full-time take-home pay, rendering it unaffordable (Shelter 2011). The housing cost overburden (or the proportion of households paying more than 40 per cent of their incomes on their housing costs) in both the UK and in Germany is highest for market tenants. What is also apparent, though, is that costs are lower on average for German tenants than UK tenants, as the following data from Eurostat illustrates. Note: The housing cost overburden rate is the percentage of the population living in households where the total housing costs (‘net’ of housing allowances) represent more than 40 per cent of disposable income (‘net’ of housing allowances). Analysis by the UK’s National Housing Federation using Eurostat data in 2015 found that average monthly rents in the UK were €902 (equivalent at the time of analysis to £730). This amounts to 40 per cent of private tenants’ income being spent on accommodation costs. In Germany, an average rent is closer to €600, only 25 per cent of household income (Koessl 2015). Rents in the UK rose by 3.1 per cent in the year to August 2016, and by 5.6 per cent in the year prior to that, while in Greater London they were up 2.7 per cent, following an increase of 7.7 per cent the year before. The same index found rents for new lets in 2016 averaged £913 across the UK and £1,497 in Greater London (Homelet 2016). This suggests rents are on an upward trajectory and we might expect further rises in the future. There are a number of factors which explain why the costs of renting are higher in the England (and the UK) than they are in Germany. One is that Germany has successfully managed to deliver faster growth in housing supply than England. Between 1951 and 2014, 30 million new homes were built across East and West Germany, compared to 13 million in England (according to the relevant tables from national statistical agencies). This has meant the supply of homes has kept pace with demand, meaning a more stable housing market, and effectively no house price inflation in the last 20 years. Without significant inflation in the housing market, the returns that landlords need to make on their investment do not significantly change over time, and therefore new landlords do not need to charge higher rents to meet the costs of their mortgages than landlords who bought their properties earlier. Within a tenancy’s agreed contractual period in England, landlords cannot increase the rent charged to tenants unless it is written into the contract. However, because rent contracts are relatively short in England, the rent paid by tenants who wish to stay in the same property can be increased every time a contract is renewed. 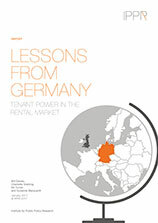 Germany’s comparably lengthy tenancies may therefore have acted as a brake on rent increases. A final key explanation for Germany’s lower rents is that they have been enforced through regulation. an assumption that there was no shortage of comparable rental properties in the area. The rent officer making the evaluation would also have to ignore the personal circumstances of the tenant. The corollary of this was that rents were typically significantly below the local market level (Wilson 2014). A look at housing benefit statistics provides some insight into average rents paid by tenants still under a regulated rental contract. In 2008, the average weekly award for standard PRS housing benefit claimants was around £107 per week – but the average weekly award for regulated tenants was as little as £71 per week, some 34 per cent lower. Even as housing benefit awards in regulated tenancies have risen, and controls over local housing allowances have been cut to the 30th percentile of the market, and frozen since 2011, average weekly awards in regulated tenancies remain some 13 per cent below unregulated claims (DWP 2016). The deregulation of tenancies that began at the end of the 1980s and continued into the 1990s was intended to stimulate investment in the PRS and to make it easier for landlords to take possession of their property (Wilson 2014). Consequently, there are now very few privately rented properties in England that remain subject to any effective form of rent control. While there are no accurate estimates of the number of regulated tenancies left in England, the numbers of regulated tenancies claiming housing benefit is tiny – of around 1.5 million private tenants claiming housing benefit, only 25,000 live in regulated tenancies (DWP 2016). Thus in England, for the majority of tenants, there are now no robust restrictions on private rents. Yet a couple of factors can still influence rents – one is where landlord’s rent-setting is influenced by housing benefit levels. Previous evidence has found that reducing housing benefit levels can, in some areas, reduce rents (Gibbons and Manning 2006, Brewer et al 2014). However, this is only effective in low-demand markets, and in any case, five years of freezes to housing benefits have eaten away at the leverage housing-benefit-setting might have had on market rents. Tenants can attempt to reduce what they perceive to be an excessive rent by appealing to a First-tier Tribunal (Property Chamber) – a group made up usually of a surveyor, lawyer and lay member (Shelter 2016). Any application against an excessive rent must be made within the first six months of an AST (if you renew the tenancy, you cannot apply). In doing so, a tenant would need to demonstrate that their rents were far in excess of the local market rate for equivalent properties. If approved, the rent could be reduced accordingly. However, this avenue is rarely utilised – the insecurity of tenure that comes with an AST means that while a rent may be adjusted for the remaining period of the tenancy, this would not prevent legal eviction procedures beginning at the end of the contracted period – the absence of security of tenure from either a length of tenure or evictions standpoint, mean that in the current context, the restrictions on excessive rents have no impact on the market: there were only around 9,000 residential property tribunal cases in 2013/14, and rent dispute cases are only one part of their role, which covers right to buy, leasehold valuations, park homes and a range of other residential property issues. While England’s policymakers have stepped away from rent-setting in the PRS, Germany has been increasingly active in protecting tenants from rent increases, through both first and, now, second generation rent controls. The ‘first’ generation model typically caps rents at a specific level relative to local market rents, whereas the ‘second’ generation typically limits rent increases within the period of the tenancy for individual tenants. The second generation model has held a long-standing role in Germany’s rental markets, and operationally restricts the scale of rent increases that can be applied during a tenancy. The landlord can determine the rent at the time of the property coming to the market. Obviously, this model is underpinned by strong tenancy rights. For example, over a three-year period, rents cannot be increased by more than 20 per cent, and landlords are restricted to maintaining rents at a given level for at least 12 months. Tenants also have a month to decide whether or not to accept the rent increase and, in the case of rejecting the proposed increase, two further months’ notice before moving out. Tenants can therefore be guaranteed 15 months of renting at a set rental amount (Fitzsimons 2014). The evidence suggests that the model was, for sitting tenants at least, effective in that the rents paid by long-standing tenants subject to the regulation were significantly below local market levels (Whitehead et al 2012). Yet, despite the effectiveness of second generation controls, in 2015 the federal government returned to a system of rent caps – ‘the rent brake’ (Mietpreisbremse), where Land governments (or state governments), in high-pressure housing markets (based on rent levels, rent increases, population growth, and levels of empty properties) can introduce a maximum local rent ceiling. It acts by prohibiting landlords from charging rents for similar properties in excess of 10 per cent above a given local average (unless the previous tenant had paid above that level, in which case the new tenant could be charged up to the level paid hitherto). The brake applies only to new tenancies, and therefore tenants cannot renegotiate retrospectively if they think their current tenancy exceeds the current local rent ceiling. To prevent a wider impact on the development market, the brake exempts newly built homes from any rent controls for the time being. To date, this legislation has been enacted in all of Berlin and Hamburg, several major cities in North-Rhine Westphalia and, interestingly, in over 100 municipalities in the staunchly conservative state of Bavaria (Stiftung Warentest 2016). There are a number of challenges to implementing the rent brake that are worth considering, including the impact on supply and quality, and the information needed to enforce rent controls. In some ways, the German system has sought to offset some of the risks associated with rent controls, such as the impact on supply and the risk that the quality of accommodation is lower. This is because the new law does not apply to new builds, or to homes that have been subject to extensive modernisation. However, the supply impact may not have been fully avoided. An exercise carried out by Deschermeier et al (2016), using data from 2014 on the PRS in Berlin and Cologne concludes that there is a very real danger of supply diminishing – through rising sales to owner-occupiers as the returns on renting become less attractive – and demand increasing, where tenants anticipate affordable and attractive rents. Further, the rules around modernisation expose a significant loophole, and give the landlord a very strong position vis-à-vis the tenant (Fitzsimons 2014). When modernisation takes place the landlord can pass on the costs to the tenant and increase the annual rent by 11 per cent of the cost of the modernisation. This increase can occur in addition to a normal rent increase. Even once the costs of the modernisation have been paid off by the tenant, the rent can stay at the higher level. Moreover, the landlord can justify further rent increases because the dwelling is now at a higher standard. The modernisation legislation has therefore acted as an investment strategy to bypass rent controls. As a result, future rent increases are now less predictable for tenants, and rent increases can be so high that tenants are, in effect, forced to leave. As a result, the city authority in Berlin has acted to prevent conversions of normal flats into luxury apartments in certain overheating areas of the city to limit this kind of behaviour, as well as banning Airbnb lettings in certain areas to ensure that homes are not converted into short-term holiday lets (Spiegel 2016). The other significant problem with the rent brake, as designed, is the enforcement mechanism. In order to take action, a tenant would need to secure a tenancy, then take legal action against the landlord to get the rent reduced. The first problem is that the landlord would face no penalty or backdating for charging excessive rent, even if the rent was reduced post-arbitration. Second, having just accepted a new rent, by ‘signing on the dotted line’, tenants may be reluctant to launch immediate legal action to challenge that rent (Berliner Mieterverein 2016a). In response to these enforcement issues the Berlin Tenants’ Union launched a campaign to encourage tenants to check their new rent (Berliner Mieterverein 2016b). Only 58 tenants took advantage of this facility (out of over 100,000 tenancies signed in Berlin each year). In 95 per cent of cases the rent appeared to be above the level permitted, with an average excess of 32 per cent – although of course in this case hefty ‘selection bias’ is likely, as those undertaking the check were likely to be concerned about their level of rent. Third, although a tenant has the right to ask whether a rent is in excess of 10 per cent of the local reference rent (based on local rent tables), this information is not always available to them at the start of the tenancy. All local rent tables must make reference to size, layout, fittings and fixtures, quality, and location when establishing comparable rates. However, methodologies for classifying properties and areas can be vague and lacking in transparency. The result is that controls effectively become a freeze covering whole areas. Costly to compile, the ability for local areas to employ more rigorous techniques and keep tables up-to-date is a further challenge. If more representative and regular tables could be guaranteed, the rent controls would be limited to the outliers. Landlords would therefore have less incentive to sell, and supply would remain more constant (ibid: 20). Currently, Germany is a long way from that point: of the 294 municipalities in which the rent brake applies, only 77 advertise any rent tables on their website, and even a major city like Bremen lacks such a table (Stiftung Warentest 2016). In fact, this then has the opposite effect to that feared by Deschermeier et al (2016): a tenant would need to set out, in his or her legal challenge of the rent, details of why the rent was excessive, in effect needing to construct an evidence base: a serious obstacle to implementation. So far three studies have been conducted on the impact of the rent brake. The first, by the consultancy Empirica (2016), analysed rents in five major German cities in the months after the introduction of the brake. It had three main findings. The median rent for a new tenancy fell in the months immediately following the introduction of the brake, by up to 2 per cent, but then climbed to the previous level, or in the case of Düsseldorf (up 3.5 per cent after 5 months) and Berlin (up 2 per cent after six months) exceeded it (ibid: 1). In Berlin the number of flats for sale exceeded the number of flats for rent, suggesting that landlords were ‘selling up’ to avoid having to offer a restricted rent (ibid: 2–3). Contrary to expectations, in only one of the cities studied – Munich – had rents at the bottom end of the market fallen (ibid: 2). The Berlin Tenants’ Union also commissioned two studies to investigate the impact of the rent brake. Regio Kontext (2016) analysed over 50,000 rental property advertisements in Berlin from the time both before and after the introduction of the rent brake. It found over 80 per cent of properties appeared to be above the level permitted, with an average excess of €2.18 per m2 per month (35 per cent above the permitted level). Excesses were particularly pronounced in the older buildings in the city (pre-1918), and were more modest in flats in the east of the city, built between 1973 and 1990. A further study, by the IFSS (2016), drew a similar conclusion, with an analysis not only of private advertisements on a particular day in March 2016, but also advertisements from public housing companies. It found average rents were above the permitted level, with especially high values in attractive central districts. There was a distinction between types of landlord: the levels of excess were highest for small private landlords (€3.08 per m2), and private companies (€2.35 per m2), with public housing companies exceeding the permitted level by far less (€0.39 per m2). While there is little appetite in the current government for rent controls in the PRS in England, the German efforts to introduce caps highlight a number of lessons for those interested in their design, which can be summarised as follows. Rent brakes need to be underpinned by live, good quality data. Placing responsibility on tenants to enforce rents brakes after they have signed the contract weakens their position vis-à-vis the landlord – different models that put the onus on the landlord setting rents appropriately are necessary. Exemptions for substantial improvements need to be designed carefully if affordable housing supply is to be maintained. lead landlords to seek other means of generating income from their properties, circumventing any controls by charging for other elements tied to the tenancy (for example, inventory). encourage landlords to sell where the demand of house buyers – and the prices they are willing to pay – will come to exceed the potential income from future tenants (Deschermeier et al 2016). It is too early to draw firm conclusions on the impact of the German rent brake – however, the studies pointed at hitherto suggest the design of the ‘second generation’ rent controls (those affecting new tenancies) is sufficiently unwieldy for tenants that it will be seriously limited in its effects. Nonetheless, looking at England, it is difficult to conclude that the fully liberalised system is the best model in town. While investment in buy-to-let has grown significantly, and the quality of housing has generally improved over the last few decades (though the PRS continues to be in much worse condition than other tenures) from the important perspective of tenant affordability, it is clear that liberalising rent setting has not spurred new supply to the extent that affordability has improved. Rents are consuming a growing proportion of household incomes, and housing benefit in the private rented sector is absorbing a significant proportion of the costs. In the last year alone, some £9.4 billion was spent subsidising the costs of private rents for households on low incomes (DWP 2016) – a number that has sharply increased in recent years. 8 Note: The housing cost overburden rate is the percentage of the population living in households where the total housing costs (‘net’ of housing allowances) represent more than 40 per cent of disposable income (‘net’ of housing allowances). Beyond the security of tenure and rent setting distinctions, a final significant difference between the rental markets in England and Germany is the structure of the support available for tenants in dispute with their landlords. In England, while tenant groups are more common in social housing, there are no strong large-scale tenant organisations for the PRS. Instead, tenants can obtain free advice on how to address problems with their tenancies through organisations like Citizens Advice, or Shelter, although these organisations have witnessed dramatic funding reductions in recent years (Bowcott 2013), with reductions in legal aid and local government funding. Local authorities may also provide some support directly, in ensuring landlords meet their legal obligations or to prevent homelessness. In recent years the national campaigning organisation Generation Rent has also come forward as a representative body for tenant rights. While seeking to influence legislation and policy, they also aim to establish a network of private tenants organised through local private tenants’ groups. However, activity here is again focused primarily on campaigns as opposed to a more formal union-based structure. In Germany tenants are much more strongly organised at both the local and national level, and are therefore better able to individually and collectively bargain for improved conditions and to address legal issues with their landlords. The German Tenants ‘Association (DMB) represents around 320 distinct tenants’ associations who provide legal cover and advice to their members in exchange for membership fees. The 320 organisations that are members of the union are estimated to represent around 1.3 million tenant households in Germany, or some 3 million tenants. Unlike with other forms of insurance or legal cover, it is possible to join a tenants’ association when a problem arises, and immediately get assistance, so in practice protection is even more widespread. Moreover, there are over 21 million legal expenses protection insurance policies held in Germany (GDV 2013) which, as well as providing financial support for arbitration, provide assistance for court cases too. In both countries (for the UK, see Battersby 2015), issues between tenants and landlords are usually dealt with outside of the courts, either informally between landlords and local authorities, or in Germany’s cases, in local arbitration services, tenancy association negotiations with landlords, or other local formal and informal mechanisms. Estimates from the DMB suggest that it handles some 1.2 million legal consultations per year, with 97 per cent of issues raised being dealt with outside of the judicial system (Deutscher Mieterbund 2016). English statistics on landlord and tenant disputes are opaque, and the limited data is spread across a wide range of data sources. Residential property tribunals oversaw around 9,000 cases, while other data from the Department of Justice show that private landlord’s claims on repossessing their properties numbered around 22,000 claims in 2015 (Department of Justice 2016). In Germany there are estimated to be some 270,000 cases per year in the German court (Deutscher Mieterbund 2015). Given that the cost associated with going to the lowest court will often be around half of the amount of the money at stake (Berliner Mieterverein 2013), it is understandable that both landlords, tenants and their representative bodies are keen to avoid the formal legal route, but this also explains why legal insurance and membership of local tenants associations is relatively popular. With legal cover financed through membership fees, there are obvious incentives for tenants to exercise their rights more readily, especially in an environment where tenancies are highly protected. According to Fitzsimons (2014), the same is not true of landlords; legal insurance for landlords is significantly more expensive, and thus less popular, which in itself may encourage more landlords to settle earlier. No such equivalent tenant insurance system exists in the UK. Moreover, as set out above, a major problem with the ‘rent brake’ to date has been that it requires a tenant to pursue individual litigation to demonstrate that their rents are excessive, and in practice that hurdle has proven too high for tenants – something that will be even more difficult for low-income tenants who are not protected by municipal tenant associations – making the issue of an insider/outsider market more challenging still for those on low incomes. Understanding why German tenants enjoy such greater protection needs to be situated in terms of their political power. The wider cross section of households who rent, in terms of age and income, may help to explain why German governments have been more prepared to be interventionist and pro-tenant than their English counterparts. Given the size of the renting population in Germany, the German renting classes have a wider and deeper electoral powerbase than the smaller, younger and more mobile English rented sector. Germany’s electoral system may advantage tenants too: individuals in Germany are registered automatically once they register with the municipality – a necessary stage in moving property – and thus the process is much easier. Thus, there is less variation in registration rates across tenure types in Germany. Turnout, however, still differs, with estimates using European Social Survey data suggesting homeowners vote at a rate of 87 per cent compared to 76 per cent of non-homeowners (André et al 2015). This remains higher than the rates of English tenants, though, and suggests residents in the German PRS would tend to enjoy more voice in German politics, not least because renting is more of a ‘mainstream’ tenure, and settled individuals with a stable income are far more likely both to vote (in both countries), and, in Germany, to rent rather than own their home. English tenants on the other hand tend to have weaker power at the ballot box, not just because they are smaller in number, but also because of the transient nature of rental populations and the requirement to register to vote individually through a distinct process (one which is not tied to other administrative requirements attached to moving house) upon each move. The latest Electoral Commission figures for Great Britain report that those who own their house outright have a registration rate of 94 per cent, with mortgage/shared ownership individuals registered at 89 per cent and social tenants at 81 per cent. In stark contrast, only 63 per cent of private tenants are registered (Electoral Commission 2014: 38). In elections, tenants’ turnout is also far lower – in part due to non-registration, but also as a result of tenants typically being less connected to a local community and more likely to be living in shared accommodation where direct canvassing is more difficult. In the 2015 UK general election, only 51 per cent of tenants are thought to have voted compared to 56 per cent of social tenants, 69 per cent of mortgage holders, and 77 per cent of homeowners (Ipsos-MORI 2015). It would certainly appear that both through the courts and, more importantly, through informal action stopping short of a full legal process, German tenants are able, backed by lawyers or tenants’ unions, to hold landlords to account. We should be wary, however, of drawing from this the conclusion that a future English system, relying on individual litigation to enforce rights, is necessarily the best way to support tenants to enforce their rights. It might also be the case that the nature of tenants and renting in Germany (with a wider cross-section of society, including more stable, prosperous and highly educated households, coupled with strong security of tenure) leads to more assertiveness vis-à-vis landlords through the legal process. 9 Interview with city official, August 2015. From this overview, it is clear that sitting tenants in Germany enjoy stronger stability and protection in the rental market than their English neighbours, and at significantly lower costs. In particular, they benefit from greater security of tenure, protection from no-fault evictions, and the presumption that tenancies will be indefinite unless the tenant wishes to terminate the contract. Coupled with lower rental costs generally, and the imposition of both first and second generation rent controls, sitting tenants enjoy much greater protection from increased rents than do English tenants, who face the prospect of regular tenancy renewals and corresponding rent increases – as well as the broader disruption of more regular moves. The statutory protection is an important distinguishing feature, locking in longer tenancies and rent safeguards. But tenants also enjoy protection from civil society organisations, through tenant associations, for which no parallel exists in England. This offers a further degree of protection to tenants: their membership organisations can do their legal bidding in disputes with landlords over security, quality, and also the fixing of rents. As the rental market in England grows, as it has done quickly in the last decade, increased political power for tenants may follow, and with it more structural reforms to support struggling tenants to manage their tenancies, their rents, and disputes with their landlords. Typically last at least 6 months, usually a year, before being continued through a rolling contract. Must be invested by landlord, typically in a savings bank account. Must be paid into a national tenancy deposit scheme. Charged by letting agents for matching tenants with landlords. Historically, equivalent to one month’s rent but following a ban on charging tenants, the cost rests solely on landlords. Charged by letting agents for matching tenants with landlords. Typically around £350, and charged both to tenants and landlords. In November 2016, the government announced plans to ban letting fees. Tenants: (1) ‘ordinary notice’ of three months; (2) ‘immediate notice’ (in cases where there is deemed to be significant endangerment to health). Landlords: (1) ‘ordinary notice’ of three to nine months (dependent on length of tenancy and must include supporting evidence); (2) ‘immediate notices’ (in cases of late payment, criminal activity etc. ); (3) ‘special notices’ (in cases of tenant death). Tenants: two months’ notice required following end of AST-defined period. Landlords: two months’ notice required following end of AST-defined period. No evidence or justification is required to evict on these grounds. 2015: Rents cannot be set at more than 10% of comparable properties in the areas in these high-pressure housing markets. No practical form of rent control outside of AST-defined rent (potential to refer excessive rent to a tribunal but landlord retains option of ending tenancy if dissatisfied with outcome). German Tenants’ Association (and associated local branches). No large-scale tenants’ associations beyond the social housing sector. Legal fees covered by membership of tenants’ association or private insurance. Limited, if any, provision within tenants’ insurance policies for covering legal fees. Clearly, the German market is not perfect. It has rigid rules that can disadvantage those looking to get into the rental market, especially those on low incomes who face a range of hurdles in accessing a settled tenancy. However, it is more fit for purpose than England’s highly liberalised market, which offers landlords a great deal of power in repossessing their property and setting rents at whatever level the market will allow, while offering tenants little by way of security and affordability. In this sense the power of landlords versus tenants is now far out of balance. Yet, this is not to argue for the transplantation of one particular model – as Kemp and Kofner (2014) persuasively argue, systems of tenure are quite strongly embedded and shifts towards liberalisation are more readily achieved than shifts towards re-regulation. Shifting towards greater security and stability for tenants would therefore be challenging, as, indeed, the German experience with the introduction of the ‘rent brake’ would appear to demonstrate. One of the major differences between England and Germany is the average tenancy length. Not only would encouraging longer tenancies in England offer greater security for tenants, it would also have the potential to keep a check on rental costs by reducing the number of contract breaks – points at which rents are more likely to be raised. Quality may also improve if tenants are able to feel a greater sense of ownership, while the opportunity to rent in a more secure way might start to shift attitudes away from the prioritisation of home ownership. Stretching tenancy length beyond the current 6–12 months could also unlock some existing potential protections that are currently constrained by short tenancies, including those that allow tenants to appeal excessive rents, or to have their demands to have improved housing conditions or management taken seriously. Short of legislative change to change tenancies across the board, which the government remains reluctant to do, there are actions the government could pursue to gradually increase tenancy lengths. not-for-profit builders should lead by example. With housing associations and local authorities moving into direct development of market rent housing, they should offer households a range of longer-term tenancy options in their purpose built PRS schemes. It would be helpful to amend schedule one of the Housing Act 1988 to allow local authorities to offer assured shorthold tenancies (which they are currently barred from doing), as part of new-build schemes, but with longer tenancies and appropriate break clauses. Across each of these, tenancy agreements should fix any future rent rises upfront, in writing. Finally, there is a role for public actors involved in the lettings market to be influencing the length of tenancies, such as social lettings agencies, but also public online lettings instruments like RentSquare. Growing the market of longer-term tenancies should reduce the incidence of rent increases, and thus act as a stabilising force on rent inflation. Given that rent controls in England are unlikely to happen in the next decade, there are nonetheless changes which could help tenants in enforcing their rights against excessive rents, and lessons drawn from the German rental system that could prove helpful. the Valuation Office Agency should publish more granular detail on the local cost of renting so tenants know whether they are paying a reasonable local rate. This should include the full range of property types (detached, semi, room, maisonette) and property sizes alongside the average prices at the ward level. As well as allowing tenants to informally challenge their rent with their landlord, it would also support tenants to contest unreasonable rents through the tribunal process. local authorities and governments should work with the insurance industry to establish an insurance product to replace the tenancy deposit. both Germany and England should continue to experiment with online platforms (such as RentSquare) to link up landlords directly with tenants, and cut out letting agent fees and contract renewal costs. While representation of tenants within the electorate is unlikely to change noticeably in the absence of wider reform to registration and franchise procedures, taking a lead from the tenants’ association system in Germany, tenants in England could enjoy greater voice and protection through an elevated role for trade unions in representing the private tenants. Trade unions already have structures in place that could bring accommodation and rental concerns into their remit to offer advice and support to members. More critically, however, a trade union role in offering legal protection would be a move forward in ensuring tenants are helped to take on badly performing landlords, challenge poor conditions and oppose unwarranted or disproportionate rent increases. We therefore make the following recommendations. A longer-term goal should be to start a tenants’ association nationally, with local branches, to mirror the German model. Ultimately, a more robust set of tenancy laws for England, which set out a clearer balance between the rights of the landlord and the rights of the tenant, would be the right objective for the government to pursue. In the meantime, there is much the government and also other non-government actors can do. The German model may be imperfect, and create insider/outsider issues that are undesirable. German law should also be revised so that the costs of modernisation for energy efficiency improvements can no longer be transferred entirely to the tenant in the form of increased rents – a system which can see rents become unaffordable, circumventing other tenancy protections. Nevertheless, it provides many lessons for English policymakers on how to increase tenancy lengths and support a more stable and secure model of tenure, as Germany has managed to deliver.